Obituary for Henry Bonnes | Langeland Family Funeral Homes, Inc.
Henry "Hank" J. Bonnes passed away Monday evening, March 5, 2018 in Grand Rapids with his wife, Bonnie, daughter, Victoria, and son-in-law, Peter by his side. Hank was born March 4, 1935 in Kalamazoo to Henry Sr. and Johanna (Toewater) Bonnes. 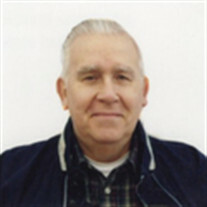 Hank graduated from Kalamazoo Central High School and then served in the Army from 1955-62 as a Military Police Officer spending some of his enlistment in Germany. He met Bonnie after returning to the states as they both cruised Downtown Kalamazoo like all the young kids did in the 1950's. They were married September 25, 1959. Hank worked for Montgomery Wards before he started his insurance career at Prudential where he retired after 32 years. Their daughter, Victoria was born in 1968. As a family, they enjoyed traveling to the Smokey Mountains and annual summer trips to the beach in Ludington. As a couple, Hank and Bonnie went to Europe in 1969 to visit friends and family. After retiring they enjoyed a tour throughout Spain. Through his life, he enjoyed model railroad building, collecting cast cars, and building amazing ship models. In his later years, he found great joy that his grandchildren had some of his same passions. His grandson, Nathan, shared his love for fishing, and they would spend much time discussing Nate's great catches. As a fan of classical music, Hank enjoyed listening to his granddaughter, Rebekah, as she embarked on her studies to become a classical and operatic performer. His grandchildren were a great source of enjoyment for him. Hank was proud of restoring Bonnie's 1968 Mustang. The couple enjoyed showing it in car shows throughout Michigan during the late 1980's and early 1990's. He was a proud member of the NRA and loved arguing politics and current events. Hank is survived by his wife of 58 years, Bonnie Bland; his daughter, Victoria (Peter) Hill; grandchildren, Rebekah and Nathan; and a nephew Steven Mejeur. He was preceded in death by his parents and a sister, Janet Heerlyn. Friends may meet the family at 2:00 pm Sunday, March 11, 2018 at the Langeland Family Funeral Homes, Westside Chapel, 3926 South 9th Street, Kalamazoo. Funeral service to follow at 3:00 pm. Fellowship and food will be served immediately following the service at same location. Interment will be Monday, March 12, at 10:00 am at Genessee Prairie Cemetery. Memorials may be directed to the Kalamazoo Humane Society or any charitable organization of your choice.